If you’ve water problems in your basement that you have been overlooking, chances are that you are losing up more than a good amount of your living space. And at the cost of housing at present that’s a huge loss. While such issues may come up due to several reasons, almost all issues can be taken care of. And for many, the best solution is to install a multipurpose sump pump like the Wayne VIP 50. It takes care of most of your water problems at a price that you can afford. 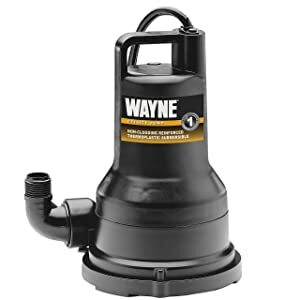 This 1/2 HP Wayne pump is made of thermoplastic which means it is strong but light and it also very durable, the thermoplastic housing also ensures that the volute, impeller and motor are not only protected from impact but also from corrosion. The submersible thermoplastic housing has a bottom suction designed to filter debris and solids up to 3/8” in diameter. It has a 1.25-inch discharge but comes with a garden hose adapter. No matter whether you plan to put in the bottom or a rain barrel or use it to drain a pool that is more than 6 feet deep down or to pump gallons of water from a hot tub into a downspout, it does the job. Yes, it’s a powerful, multipurpose pump that can be used for both residential and commercial applications. The oil free thermoplastic casing protects the pump and makes it lighter and portable enough to carry. This pump can be used for multiple applications and offers a truly trouble free operation. The hourly output of 2500 gallons per hour makes it suitable to use as a sump pump. It can handle lifting 15590 gallons of up to 10ft per hour. This WAYNE VIP50 1/2 HP electric water removal pump is designed for different applications. It can be used to drain sumps, water tanks, ponds, aquariums and clogged sinks. Wayne Pumps have become synonymous with quality and they come with a full 1-year warranty. Parts are easy to source and finding someone qualified to repair a Wayne pump is easy. This pump is able to pump out mucky or sludgy water fairly well. The intake has a special screen to get rid of debris larger than say a pea. Anything thicker will need a discharge hose that is larger than a ½’ standard garden hose. If the muck pours like cream this unit will perhaps take it, however, if it is thick as a milk shake or pudding it won’t pump it out. The pump has an easy-access handle, which makes it easier to carry around, and it requires no complicated assembly. It is not supposed to clog but depending on the kind and amount of debris in the water, you need to keep checking the filer to make sure it doesn’t get clogged too much. You might also need to attach a bigger garden hose if you want to improve the discharge volume of the pump. The cord that this pump comes with is not too long. You can always buy an extension cord with the appropriate wattage requirements for the pump. Pumps like this one don’t have a lot of lift so it might come short if you have to lift higher than 10ft. It is not equipped with an automatic switch or float so it needs to be checked every now and then to avoid having it run dry. But, in most cases, it is this float switch which is the greatest source of pump troubles. There isn’t much to gripe about when it comes to what this pump does. It is a robust pump designed to be a multipurpose utility pump and it delivers. Its portability makes it easy to remove water from flooded basements to flat roofs and a lot of other places where water collects.